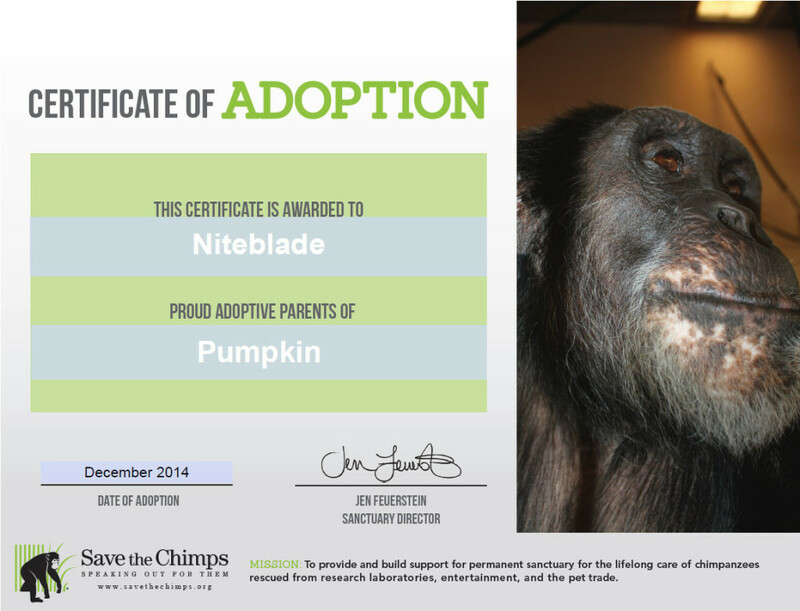 Last month Niteblade became the proud adoptive parent of Pumpkin, from Save the Chimps. Pumpkin was born in a laboratory, taken from his mother before he was two and ‘knocked down’ (anesthetized in what tends to be a very traumatic way) about 180 times and had his liver biopsied at least 23 times. By the time he was five years old, Pumpkin was self-mutilating. 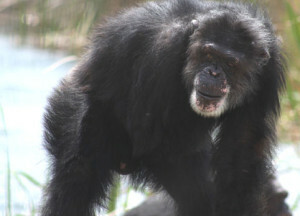 In 2002, when Pumpkin was about 16 he was rescued by Save the Chimps and has been recovering in their sanctuary since then. These days he no longer self-mutilates and has been spending more and more time outside on ‘the island’ (which is a big thing for chimps raised in captivity). These things, Pumpkin’s rescue and rehabilitation, would not be possible without donations received by Save the Chimps, and I’m exceedingly proud that the Niteblade family is counted among those donors. Thank all of you, but an especially big thank you to the authors who donate their payment to help chimpanzees like Pumpkin. Your generosity matters and it does make a difference. Read more about Pumpkin here. ETA: This is the second chimp Niteblade has adopted. The first was Rufus. This is Rufus. 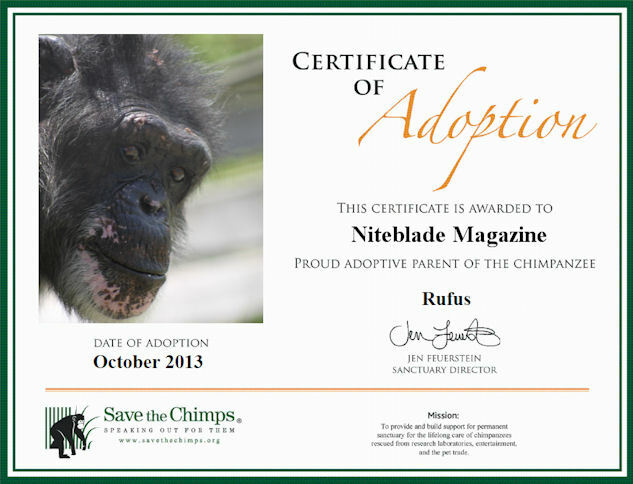 Due to the generosity of many of Niteblade’s authors and poets, we were able to “adopt” Rufus from Save the Chimps last month. As described in this Miscellanea blog post, contributors are given a choice of being paid via paypal or of donating their payment to Save the Chimps. I had hoped that maybe we would be able to adopt a chimp every 18 months or so, but I was blown away by the number of people donating their payment. We reached the $75 goal quite some time ago and then had a bit of a vote to decide which chimp we’d adopt. Rufus won by a landslide. You can learn more about Rufus (and see more photos of him) right here — All About Rufus. The reason I’m just blogging about our adoption of Rufus now is that I must have made a mistake when I filled out the paperwork to adopt him. The original certificate (which exists solely for bragging rights) listed me, personally, as the person who adopted Rufus (though I’d said in the papers that it was on behalf of Niteblade Magazine). I emailed Save the Chimps to see if they could provide me with a certificate that more accurately reflected reality but so far I haven’t heard back (no doubt since they are busy helping chimps). So what you see above is a copy of the certificate which I edited to give credit where it belonged. Thank you to everyone who donated their payment to support Save the Chimps, and to everyone who voted to help us decide which chimp to adopt! It’s a small thing we’ve done, but because of you, Niteblade is changing lives and helping to make the world a better place, and how awesome is that?